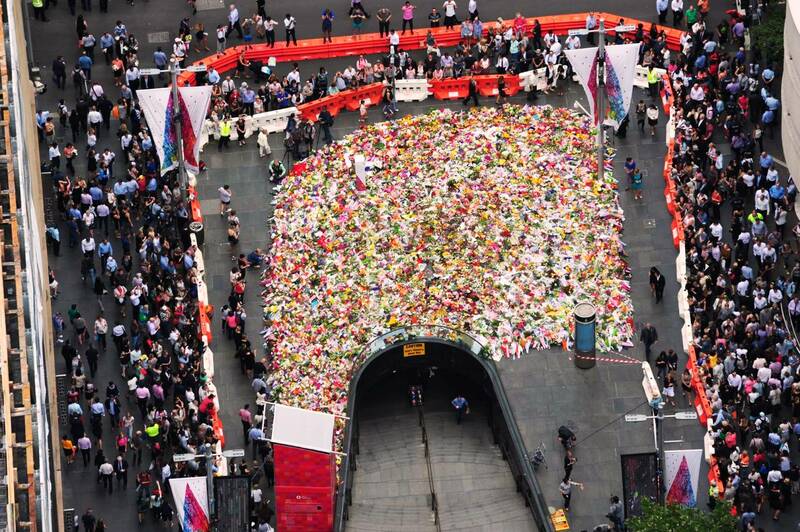 The floral tribute left by Sydneysiders at Martin Place. Photo by NSW Police Force Airwing. The 16-hour siege at the Lindt Café in Sydney’s Martin Place, which began on Monday was like sudden, terrible, earthquake in our peaceful city. Unfortunately the aftershocks of the crime by the single gunman will continue for some time, especially for the loved ones of the two hostages who died, and the traumatised survivors. I kept away from the media’s blanket coverage of the horror, but checked in from time to time and there were three early responses to the events that I found helpful in the first day or two as Australians began to process what had happened. You might have seen them already, but I thought I’d offer them here just in case anyone who hadn’t was interested. Archbishop Anthony Fisher’s homily at a Mass in St Mary’s Catheral for the victims of the siege. Sydney blogger Laura McAlister’s post, 7 Reasons to Be Grateful After the Sydney Siege. Also, I know on Monday as the siege was happening that some parents were looking for ideas about what and how much to tell their children about it. Australian psychologist Dr Justin Coulson was asked for tips for parents on how to speak to their children about the siege. He responded briefly along the lines of this article he wrote earlier this year: Talking to Children About Tragic Events in the News. I’m sympathetic to his advice to shield young children under age 10 from terrible things in the news as much as possible. It’s what we’ve done this week, although I did have to tell my eldest daughter some of what was happening on Monday as she was curious after her dad came home early from the city and she overheard snippets of my conversation with him and a friend during the day. Since then we have had the news of many children and teenagers being massacred along with staff at their school in Pakistan by the Taliban. That was when I decided I’d had enough news for the week and went back to reading my book by Fr Jacques Philippe. If you have young children, how do you manage their exposure to very sad or frightening news? For that matter, as an adult, how do you manage your own? You’re welcome, and thank you, I didn’t see the Catholic Talk article.